Standard complete dentures are prosthetic devices constructed to replace missing teeth. It is made for people who are already missing all their teeth and it fits comfortably and chews well, but is designed for the average patient using basic tooth shades and shapes. They are supported by the surrounding soft and hard tissues of the oral cavity. The top denture relies on "suction" to retain it, and the hardness of the underlying tissues for its stability. Whereas the lower denture relies strictly on the underlying ridge for stability. 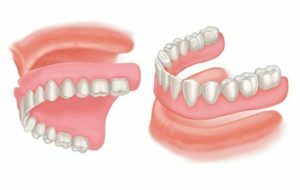 It generally takes 3 or sometimes more appointments to make a set of standard dentures. Contact New West DentureWorks today to set up an appointment with our licensed denturist.